Hundreds of proteins crucial to brain health have been identified, unlocking a new frontier in the treatment of conditions from Alzheimer’s to autism. Experts have discovered that faults in these ‘repeat offender’ brain proteins are responsible for 130 conditions. The breakthrough could greatly speed the development of new drugs for degenerative and psychiatric illnesses, as well as allowing better diagnosis. It also means that a magic bullet-type drug could be created to treat several illnesses. The excitement centres around synapses, the ‘junction boxes’ that connect nerve cells in the brain and are key to transmitting and processing information. With each of the brain’s 100billion cells capable of connecting to more than 1,000 others, faults in the synapses can have devastating effects. Until now, little was known about the proteins that lie at their heart. 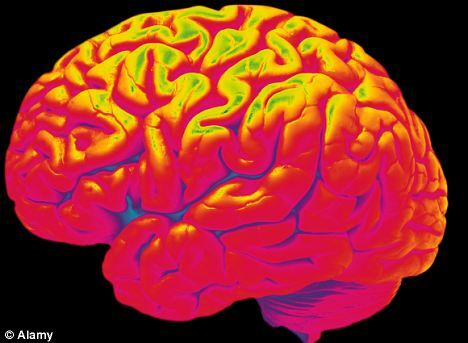 By studying tiny slivers of tissue taken from the brain, Professor Grant and colleagues at Edinburgh University identified 1,461 synapse proteins, and then linked them to conditions ranging from Alzheimer’s and Parkinson’s disease, to autism, learning difficulties and addictions. The synapse proteins were ‘at centre stage of a large range of human diseases affecting many millions of people’, Professor Grant said. He said: ‘In some cases, the proteins acting at the synapse are absolutely vital to the whole nature of the disease. The finding that the same proteins are involved in many diseases could lead to multi-condition treatments. Finding a new use for an existing drug would be much quicker than developing one from scratch. ‘We also can see ways to develop new genetic diagnostic tests and ways to help doctors classify the brain diseases,’ said Professor Grant. The study also showed synapse proteins have changed little over evolution – perhaps because they are so vital to health. Jeffrey Noebels, professor of neurology, neuroscience and human genetics at Baylor College of Medicine in the U.S., said: ‘We now have a comprehensive molecular list of more than 1,000 suspects. The data gives ‘a front row seat to witness neuroscience unravel the complexity of human brain disorders,’ he added.